His parents hired Scottish ministers to tutor their eight children. The boys were not always allowed to sleep in the impressive brick Great House, but above their school room in a separate building. Often, classes started before breakfast and ended at 5 pm each day. Author of the Westmoreland Resolutions of 1766, Mover of the Resolution for Independence, Signer of the Declaration of Independence, President of the Continental Congress, United States Senator from Virginia. Understanding Great Britain made sense to the Lee family. Richard Henry’s great-grandfather, Richard Lee, had left England in 1639 bound for Jamestown, Va., to develop a successful trade with Lees on both sides of the Atlantic. When Richard Henry was 16, he and his older brothers sailed to England in a Lee tobacco ship. It was important to Thomas and Hannah to send their children to England to educate them and to teach the customs and law. He never saw his parents again; both died in 1750. Richard Henry finished his schooling at Wakefield Academy in Yorkshire and took a brief European trip before he sailed home to Virginia. His oratory was legend – “That fine polish of language which that gentleman united with that harmonious voice so as to make me sometimes fancy that I was listening to some being inspired with more than mortal powers of embellishment” was how one observer described him. He used his hand, always wrapped in black silk due to a hunting accident, to emphasize the cadences in his remarkably musical voice. His decisions weren’t always wise. Tobacco prices dropped then fluctuated, and Anne and Richard Henry’s family grew. He forged new opportunities to make money for the family. Knowing little about the Stamp Act, Lee applied to be a tax collector in 1764. Lee was censured by the House about his interest in collecting the Stamp Act. He began to understand what “Taxation without Representation” meant to the colonies. Forgiven, he moved ahead, writing the Westmoreland Resolution of 1766, binding citizens to support “our lawful sovereign, George the Third…so far as is consistent with the preservation of our rights and liberty.” Many considered the Resolution seditious as Lee challenged the king. Later, his Resolution gave guidance to those who wrote the Declaration of Independence. Lee was elected to a Williamsburg convention opening Aug. 1, 1774. They discussed disagreements with Great Britain, and elected delegates for the first Continental Congress to be held Sept. 4, 1774, in Philadelphia. He was appointed to the committee to frame the Declaration of Rights of the Colonies, which led directly to the writing of the Declaration of Independence. On June 7, 1776, Richard Henry was accorded the well-deserved honor of introducing the bill before Congress: "…that these united Colonies are, and ought to be, free and independent States, that they are absolved from all allegiance from the British crown, and than all political connection between America and State of Great Britain is, and ought to be, totally dissolved…"
The formal act that dissolved the ties with England was adopted on July 2nd. Two days later, on July 4, 1776, the Declaration of Independence was ratified. The American Revolution became a reality. 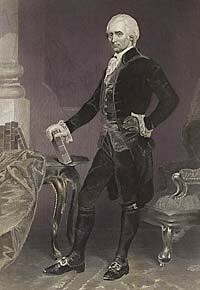 Lee was elected Virginia’s one of the first U.S. senators in 1789. He encouraged the first 10 amendments, and was successful. However, his health declined after his right hand was so affected he required a personal secretary. Then his carriage turned over in the fall of 1791. He did not resume his seat until December 1791, and ended his work there when Congress adjourned May 7, 1792. He continued as a member of the Virginia Assembly until he retired from public life in 1792 with a unanimous resolution of appreciation from the House of Delegates. The biography of Richard Henry Lee was compiled from biographies prepared by the Robert E. Lee Memorial Association (http://stratfordhall.org/meet-the-lee-family/richard-henry-1733-1794/), the Colonial Williamsburg Foundation (http://www.history.org/almanack/people/bios/biolee.cfm), and the Society of the Descendants of the Signers of the Declaration of Independence (http://www.dsdi1776.com/signers-by-state/richard-henry-lee/).